Blogging about all things Council....and some things not. Approved in 2001, the Town Center Area Plan (TCAP) was Cary’s vision and planning document for downtown redevelopment. Also approved at that time was the current zoning downtown. 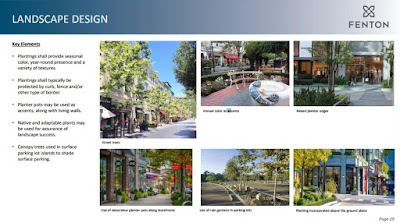 This vision was reaffirmed and further defined with the adoption of the Cary Community Plan – specifically the downtown special planning area chapter. 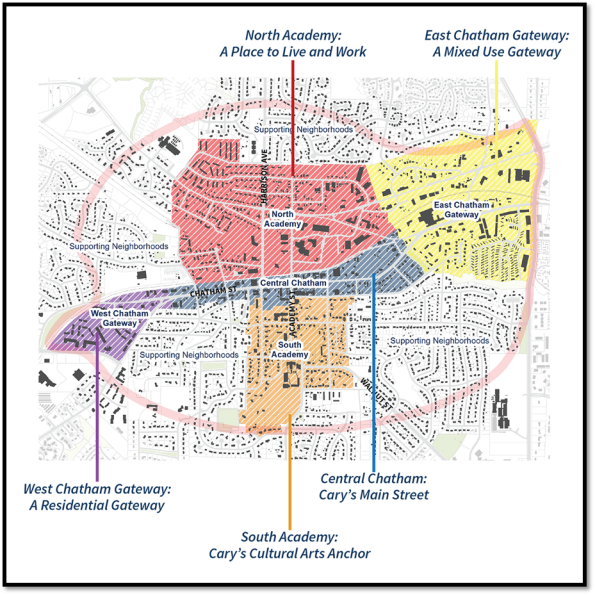 The Cary Community Plan took nearly four years to create given the unprecedented amount of community input and scrutiny. It is our community’s long-range planning document created by Cary citizens for Cary citizens. 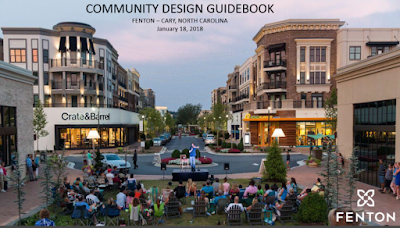 The vision for downtown Cary as defined in the Cary Community Plan is: Downtown Cary will be a vibrant, sustainable, historic, pedestrian oriented urban downtown, rich in charm and character. As the “heart and soul of Cary,” people will work, live, visit, recreate and shop in downtown. There will be an emphasis on office, residential, retail, entertainment, and civic development. Downtown will be supported by a multi‐modal transportation hub serving pedestrians, bicyclists, bus transit, train and motorists. 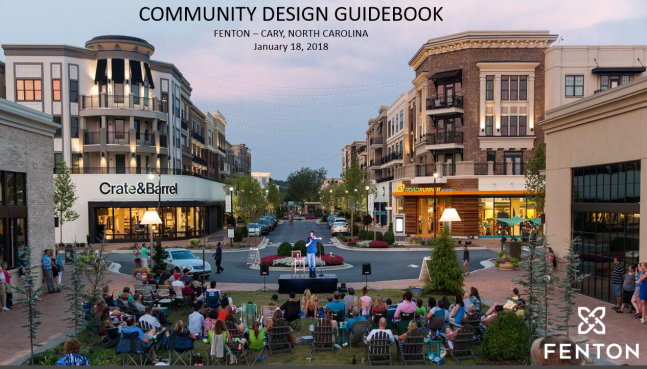 Downtown Cary will be a community gathering place for surrounding neighborhoods, all of Cary, and the Triangle Region. Thanks to targeted public investments, regulatory amendments, community support, Cary town staff AND a council who actually has the political will to act upon established plans and implement the vision, meaningful private investment is occurring downtown and there is a lot more on the way. There are however, conflicts between that which the Cary Community Plan calls for and the zoning that was established with the TCAP that need to be addressed if we are to truly realize our community’s vision for downtown. In each of those sub-areas the recommended building height is defined by stories (number of floors). The zoning however - which is what can legally be constructed – does not speak to stories and instead defines height by feet. 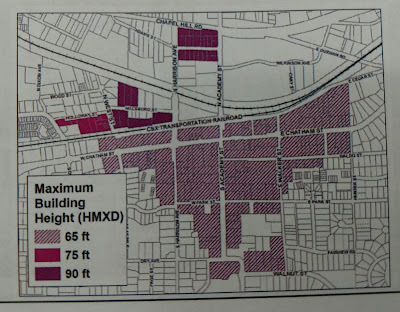 The East Chatham Gateway sub-area for example recommends building heights at 5-6 stories but notes that buildings can go higher depending on context and suitability. 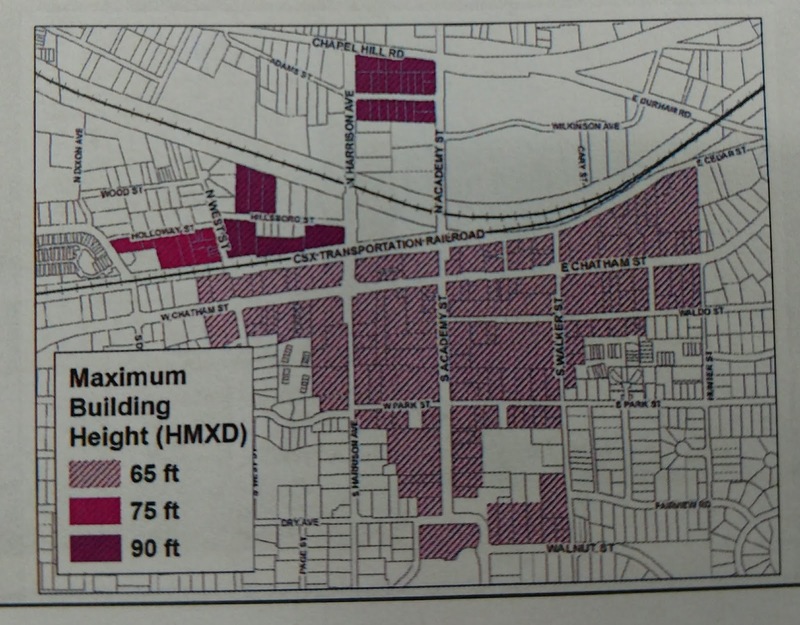 A significant amount of property in this sub-area however is zoned MXD (Mixed Use) which caps building height at 45'. You simply can’t build a 5-6 story building and keep it under 45' tall. At our recent council retreat we briefly discussed some potential Land Development Ordinance Amendments pertaining to building height - but we didn’t spend a lot of time on it as we were to have a more in depth worksession on the topic soon. I did however provide feedback that regardless of any changes proposed, I would not support increasing building height along South Academy St or the old library site when that redevelops to protect the character of the historic district and adjacent residences as best we can. Others who commented agreed. That worksession was held this past Thursday. The majority of the downtown core which includes the Central Chatham, North and South Academy sub-areas is zoned HMXD (High Density Mixed-Use). HMXD however has a range of building height limits depending on location. In the South Academy sub-area for example – which includes the downtown historic district - building height is capped at 65'. Areas of the North Academy and Central Chatham sub-areas however allow for 75-90 feet. 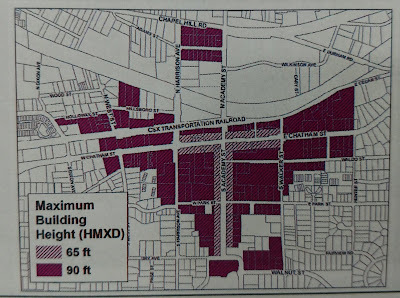 At the worksession it was proposed that we amend the HMXD zoning district to allow for 90 feet building heights throughout the district except within 100' of South Academy Street and Chatham Street between Harrison Ave and Walker Street. 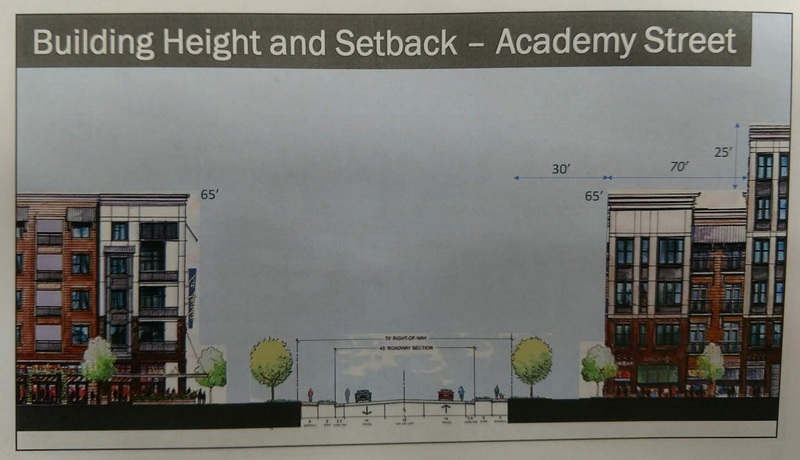 While this proposal would limit building heights fronting Academy St to 65’, once that same building was 100’ away from the street the height could then increase (step up) to 90’. That could result in a 90' tall building directly adjacent to a single family/historic home. I was not pleased with the proposed zoning change to the South Academy sub-area. I found it insensitive to adjacent properties and the historic district and unnecessary. 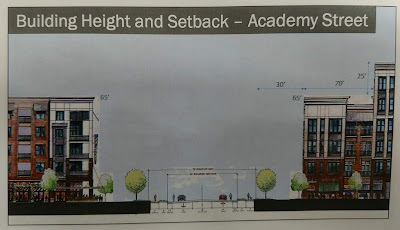 I believe 65’ is plenty tall enough – possibly even too tall along Academy St, Walker St and South Harrison Ave but there isn’t anything we can do about that. The zoning has been in place since 2001 and we can’t legally downzone someone’s property. While we absolutely need to make some development ordinance amendments to align regulatory requirements with the vision laid out in community plan, that is not the case in the South Academy sub-area. HMXD with a height limit of 65’ meets if not exceeds the community plan recommendations. From the South Academy Sub-Area Section of the Cary Community Plan: Along S. Harrison Ave., S. Academy St., Park St., and Dry St., building heights should complement and reinforce the historic built environment and small-town character, and will therefore be primarily 2 stories, except for landmark public and institutional buildings, such as the churches, Arts Center, and County Library. Buildings of 2-4 stories may be appropriate along Walnut and S. Walker Streets, in order to facilitate redevelopment, and since these areas are further away from the historic core of downtown. There will be cases where taller buildings can be accommodated, as long as designs are compatible with the predominant character of the street and adjacent and nearby properties, especially historic properties. While I can appreciate the economic challenges the development community faces in regards to land acquisition and redevelopment costs, I haven't yet heard a compelling case made as to why we should allow 90’ tall buildings in the South Academy sub-area. If an applicant thinks that they can make a compelling case, then bring it to council for a request for modification and we’ll consider it. We consider modification requests all the time - but to allow it by right is concerning. Our community invested nearly 4 years creating the Cary Community Plan. It’s a dang good plan. I think we should stick to it until a compelling case is made otherwise. Based on worksession materials staff was to also propose amending the MXD zoning district to allow for 55’ for residential buildings and 65’ for mixed use buildings that would address the conflicts between the community plan and zoning like that in the Eastern Gateway example mentioned earlier - but we never got that far. We couldn’t get past South Academy. I have no problem owning that. There will be a follow up worksession held soon. I look forward to it. Cary is one of the greatest communities to live in America. Yet after a heavy storm event, for some of our citizens, it’s all washed up. Earlier this year we created a stormwater working group comprised of impacted citizens, stormwater experts, engineers and town staff as part of a pilot program to model the impacts of stormwater using state of the art technology in the Walnut Creek Basin downtown. Assuming that our efforts are successful - and we have no intention of failing - it is our goal to implement this initiative town-wide. Vacuum truck the town uses to remove debris from pipes and culverts. It's like a giant shop-vac on wheels! That's all for now and as always, thanks for reading! The council and town staff held our third quarter meeting this past Thursday at the Matthews House in Downtown Cary. Our quarterly meetings are basically a mini council retreat where we reflect on noteworthy projects or initiatives over the last three months and discuss other important items while looking to the future. Blogworthy discussion items included the budget, recycling and the downtown park. We are still early on in the budget process and by “we” I mean the council. Town staff – especially those in finance – never really leave the budget process. As soon as one fiscal year’s budget is adopted they begin working on the next one. Who knew that collecting and spending $340 million was so complicated? 😉 Well, it is and we are blessed to have such talented folks working on it – even more so this year. This is the first year that our department directors; rather than simply submitting independent department requests to the Town Manager, worked collaboratively to identify the organization’s overall needs to submit a unified recommendation to our Town Manager. The result is a budget that more closely aligns the organization’s resources with our community’s priorities. Utility rates will increase 3% per household. Recycling is becoming more expensive. This was a very interesting part of the budget discussion. While Cary’s robust recycling program never came close to breaking even, historically we have been able to sell certain recyclables for about $10.00 a ton. Recent changes in the market however have resulted in us now paying $21.47 a ton to get rid of it. So what happened? Well nearly 40% of US recyclables are shipped to China. That is until China squashed that last year and announced that they would no longer be importing most recyclables. Supply and demand. Cary delivers roughly 11,000 tons of recyclables to Sonoco Recycling in Raleigh each year. At $10 a ton that generated $110,000.00 in revenue. Paying nearly $22 to get rid of it equals a $220,000 expenditure – a $330,000.00 swing. That stinks, and I aint talking about the trash. In the end however it is a values decision. Does our community support recycling enough to invest another $330K to keep doing it? Is diverting recyclables away from the landfill worth it? I believe so. In fact, according to Cary’s most recent biennial survey, 93.9% of Cary citizens support Cary’s recycling program - It’s the right thing to do. The council voted 6-1 to hire the Office of James Burnett (OJB) as the downtown park phase II master plan design consultant. I had previously blogged about the selection process and firms competing for the job here. All four firms are world class and there is no question that any one of them would do a wonderful job if selected. They didn’t get to where they are by being mediocre. After an extensive interview process however, the majority of our town staff and council believed OJB to be the best fit for Cary for a number of reasons. 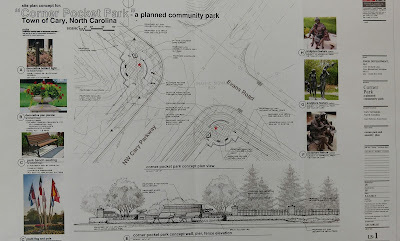 What really resonated with me was their emphasis on programming, their understanding of the park as a driver for economic development and redevelopment and that Cary’s own Withers and Ravenel are their civil engineers. While it took a little longer to get here than I had hoped, I am very pleased with the end result and look forward to the real work getting started and working with the community to develop a remarkable master plan for the park so we can start building it. Git r done! Levy Park in Houston Texas is one example of OJB's work. Click on the link above to see more. Photo courtesy OJB. That’s about it for now. As always thanks for reading and friend me on facebook or follow me on twitter for more town news and announcements. Major renovations to Cary’s Black Creek Greenway from the Old Reedy Creek Trailhead to West Dynasty moved one step closer to construction at our council meeting last night with the recognition of at least $4 million in NCDOT State Transportation Improvement Program (STIP) funds. 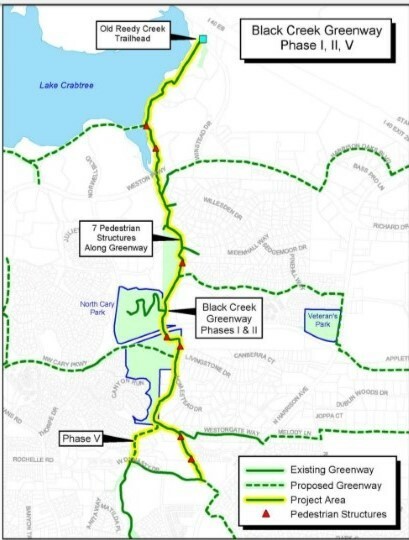 Phases I & II of Black Creek Greenway were originally constructed 25 years ago and extend approximately 2.5 miles between Old Reedy Creek Road and West Dynasty Drive. This portion of the greenway trail does not meet the current Town’s minimum design standard of ten feet wide for asphalt trails and twelve feet wide for the bridges. The greenway has also been severely impacted by heavy rains and flooding requiring major upgrades to prevent further storm damage. 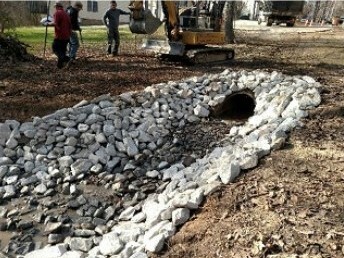 Phases I & II reconstruction will bring the greenway up to current design standards including 7 new bridges that will be upgraded and elevated to reduce stormwater impacts. 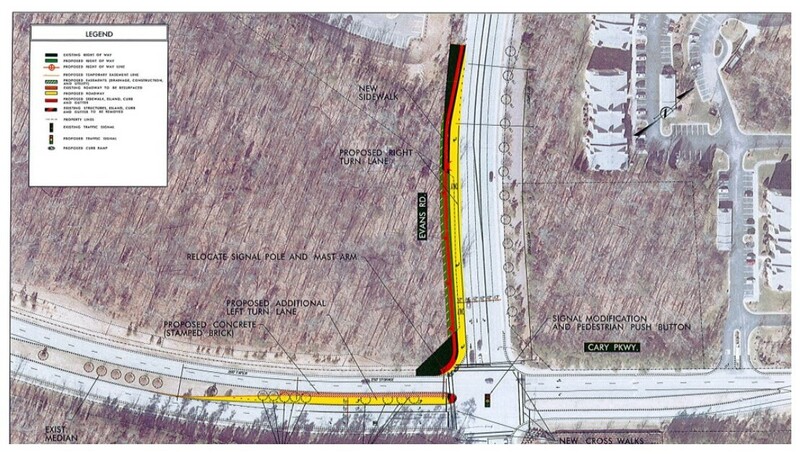 The Phase V portion of the project (see image below) is a new greenway trail. Currently, sidewalks on West Dynasty Drive provide the connection between Phases II & III of the greenway. As I am sure everyone who has traversed this section of greenway is well aware, it has extremely steep grades that make it difficult for pedestrians and cyclists. 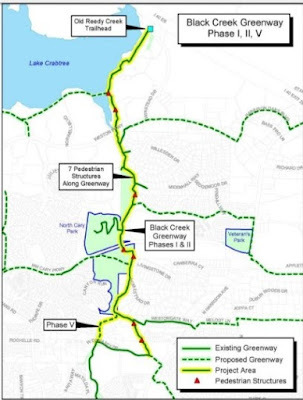 The new Phase V section of greenway eliminates the need for users of the trail to travel on the steep section of West Dynasty Drive and aligns the greenway access points directly across from each other on West Dynasty Drive. The $4 million grant from NCDOT also allows for another $1 million grant once the project has gone to bid for a total grant amount of $5 million in NCDOT STIP funds. 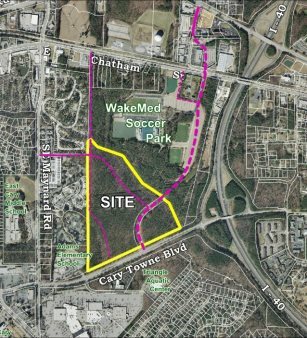 Cary’s share of the cost would be $1.6 million. We have already appropriated $2 million so roughly 400K will be returned to the general fund and become available for other needs. 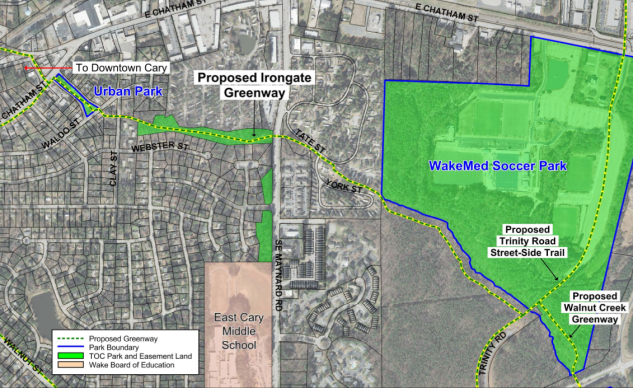 Cary will be getting a shiny new $6.6 million greenway for $1.6 million in town funds…. And did I mention it aligns the greenway crossing West Dynasty so you won’t kill yourself peddling up that crazy hill anymore? 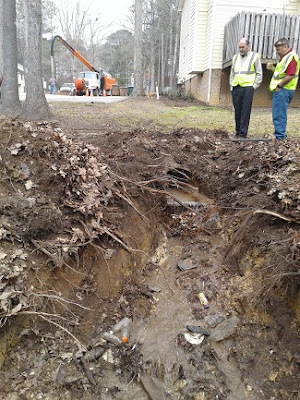 With the acceptance of grant funds, our Town of Cary staff will begin the process for acquiring the necessary easements and right-of-way for the project with a goal of initiating the construction bidding phase in 2019. 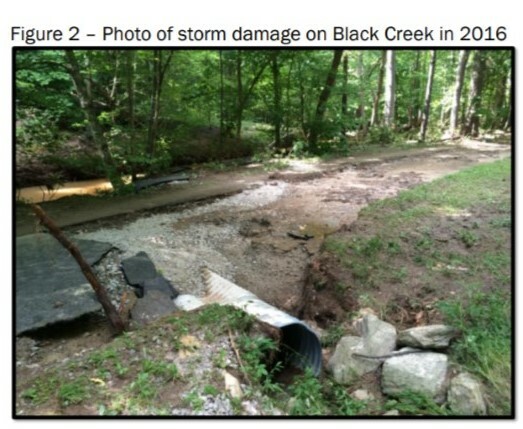 Special thanks to our amazing Town of Cary Staff and the fine folks at the Black Creek Watershed Association for all their efforts thus far. As with everything Cary, everyone working together makes great things happen! I can’t wait for this project to begin. Cary Rocks! 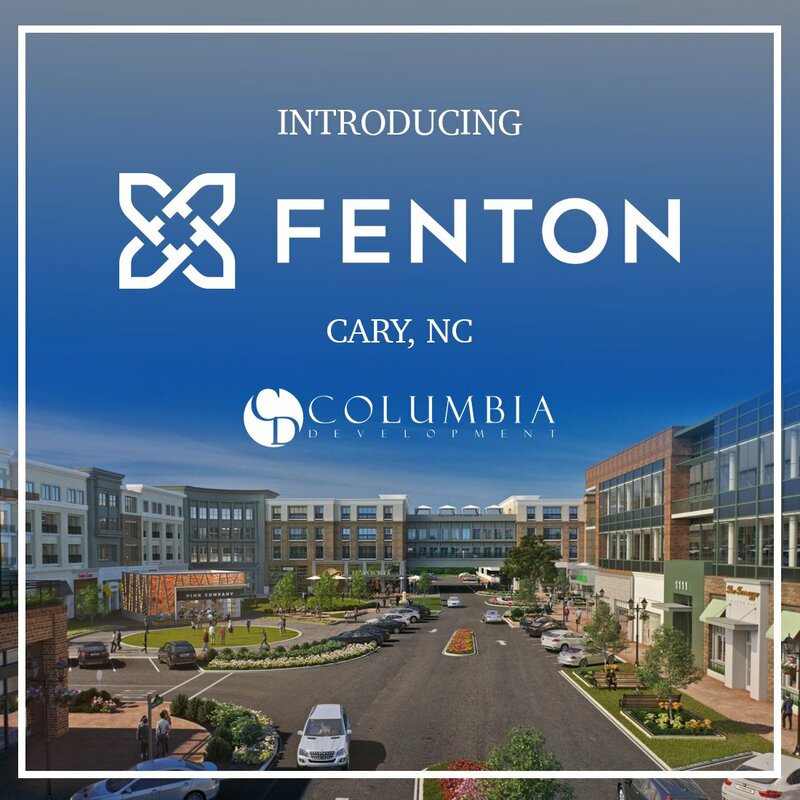 At our last council meeting the council unanimously approved Fenton, a signature mixed-use project which will be located along Cary Town Blvd. across the street from the future IKEA and Cary Town Center Mall. The “state property” (it is owned by North Carolina) has been on Cary’s radar for years. 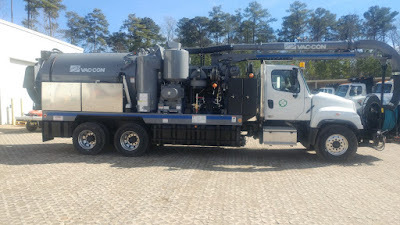 We have always had concerns that one day the state might choose to develop the site as an underwhelming government building or worse, an NCDOT fleet vehicle storage/service facility. So you can imagine our excitement when we learned that the state was putting the land up for sale. The first developer to put the property under contract proposed a residential project similar to the Inside Wade project in Raleigh. While a quality proposal, the majority of council did not believe that met Cary’s vision for the site – an employment based mixed use center – and the project was ultimately denied. 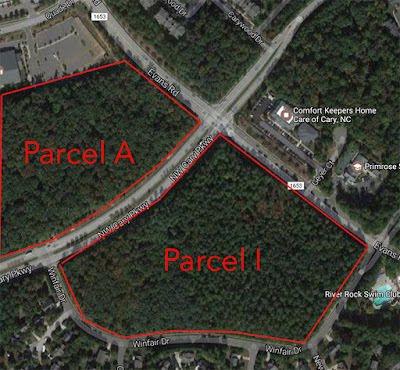 Not too long after that, in 2015 Columbia Development put the property under contract and proposed a Wegmans grocery store and a sea of surface parking - another good project, but one that again fell short of our vision for this property and Cary’s Eastern Gateway. The state property is one of Cary’s last prime undeveloped properties suitable for large class A office development – centrally located between Raleigh and Durham and in close proximity to the airport. To allow anything less than remarkable on this site would be doing our community a disservice. 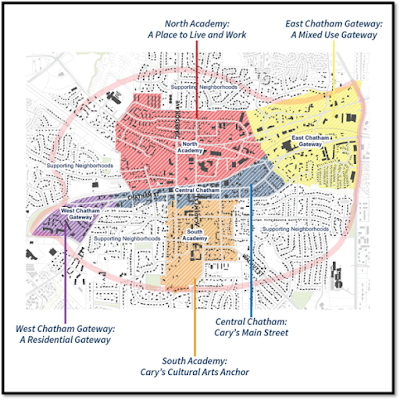 To Columbia Development’s credit they bought into our vision for Cary’s eastern Gateway, rolled up their sleeves and spent the next two years working with Cary Town Staff and the council to do just that. Fenton includes up to 2.5 million square feet of office, commercial and residential development with office being the primary user. Retail and residential however will be developed first in an effort to create a sense of place and an attractive destination where office tenants will want to locate. That said, there is nothing that prohibits an office user from coming in sooner than later. 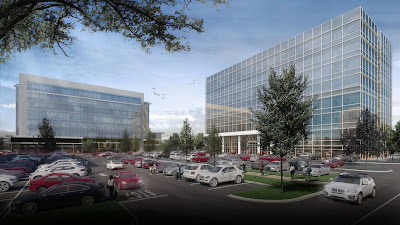 The majority of the proposed buildings that include retail uses – except for the Wegmans Grocery - will be vertically integrated with a mix of uses - that being restaurant or retail on the ground floor with either office or residential on the floors above. 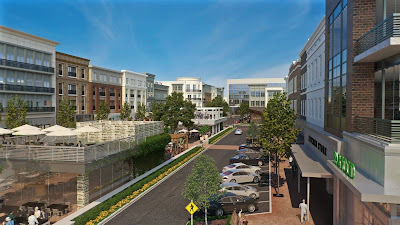 This will create an experiential “main street” to include “jewel box” retail and restaurants in the medians between the buildings – very similar to what we saw at Avalon in Alpharetta, Georgia. Proposed Fenton Site Plan. Purple indicates vertical mix of uses required. 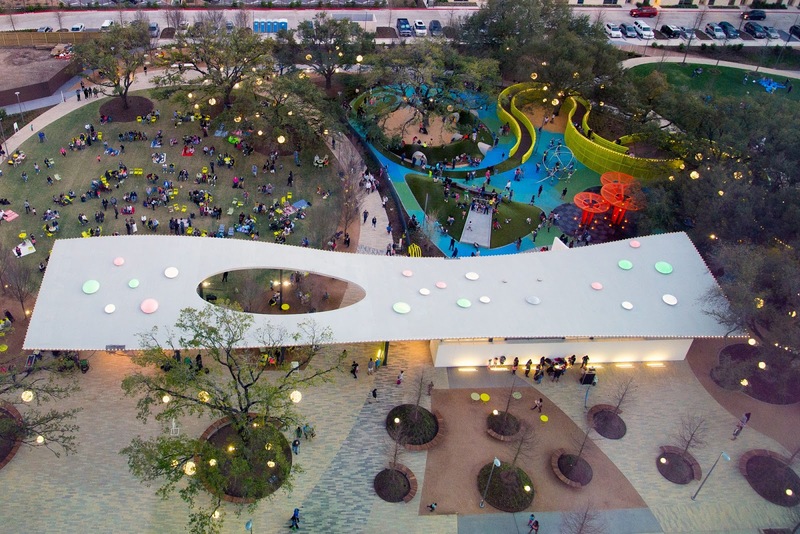 Six community gathering areas integrated into the development to provide both passive and active opportunities for residents and visitors. Eight parking decks are proposed with buildings designed to screen or wrap the decks. The Wegmans even gets a table-top parking structure. The main entrance into the site will be on Cary Town Blvd. where the "road to nowhere" that is always blocked off is located. In case you are wondering how that road ever got there, the town built it years ago when NCDOT granted the access point on Cary Town Blvd. to ensure access to future development and the Soccer Park just in case NCDOT changed their rules/criteria later on. 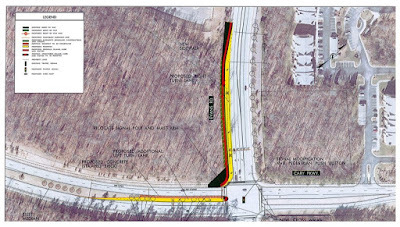 Other access points will include extending Quinard Drive from Maynard into the site, East Chatham Street from the north and a new access road along the eastern boundary of the site from Quinard Drive. Proposed transportation network - purple lines are streets. 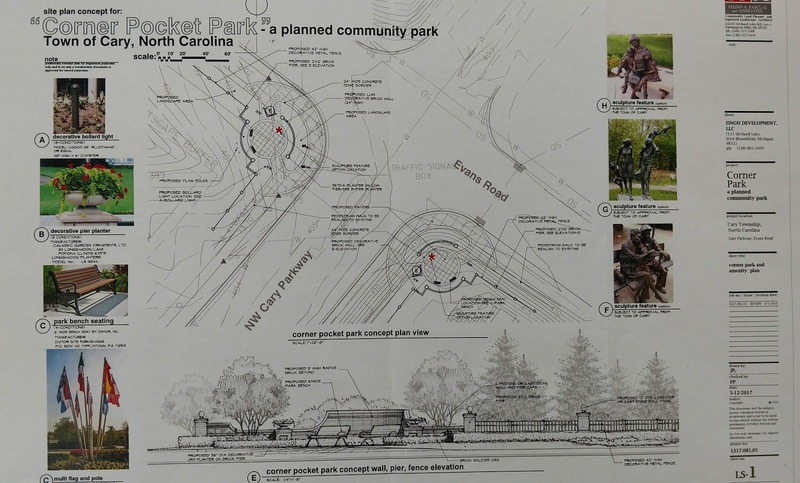 The project will provide for bike, pedestrian and transit facilities and the future IronGate Greenway from downtown will also provide access to the site. 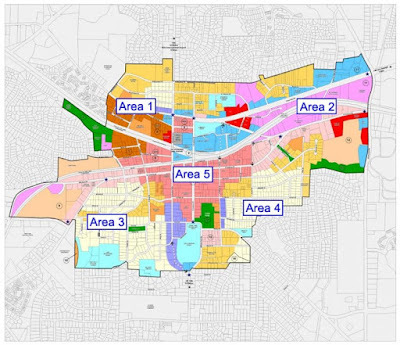 The applicant, Columbia Development, voluntarily offered over 100 different zoning conditions with this rezoning to ensure that what is promised is what get’s built. 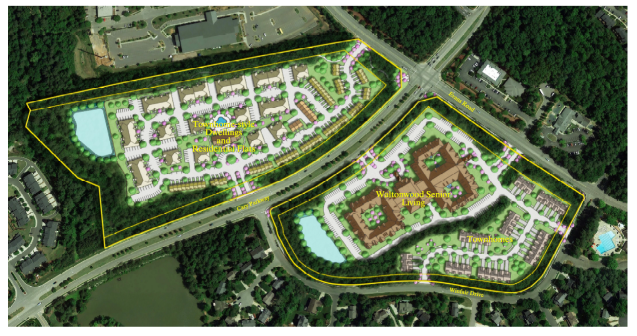 This is unprecedented for a development in Cary. Conditions offered include transportation improvements at 13 intersections, phasing and vertical mix of uses, building and use location, parking structures, public art, streetscapes and buffers, accommodation for a pedestrian bridge from this site to the Cary Town Center Mall site, bike/ped/transit facilities, etc..
Two unique conditions offered include a design guidebook and developer agreement with the town. The Design Guidebook is offered as a commitment that the development of all buildings, structures, hardscape, site furnishings, lighting, screening, landscaping, signage, and public art (the “site elements”) shall be “substantially similar” to characteristics and features promised by the applicant and “sold” to the town via their marketing materials and our trip to Avalon. Many elements of the design guidebook far exceed town standards. If you want to see the entire Design Guidebook, click here and scroll to the bottom of the page and click the Design Guidebook link - it's a 12 MB PDF. A development agreement is a legal agreement between the town and the developer. The agreement provides a level of certainty to the developer regarding what can be built when and what mitigation measures will be required. It also provides the Town with the opportunity to look at the long-term horizon and ensure that the development will fit with the Town’s comprehensive planning efforts and local policies in more detail than a rezoning allows. In addition, development agreements give the Town greater flexibility in determining conditions and requirements for the project, and allow greater latitude and more creative solutions to address impacts, including potential Town contributions. Since the development agreement is a condition of the rezoning, no development may occur unless it complies with the development agreement. The development agreement provides the opportunity to address a variety of topics related to this project in greater detail, including but not limited to provisions related to timing, phasing, intensity of development, and funding of infrastructure construction. We hope to have the developer agreement completed by late February or March. All this seems pretty complicated, right? In a previous blog post I compared the process to making Grandma’s famous chili – that if you rushed it or cut corners it wouldn’t be as good as it could have been. Same thing here. We spent a great deal of time making sure we got all the ingredients right to ensure a truly remarkable project. That said, as with any project of this magnitude I'm sure we'll run into a few unforeseen issues here and there. I am confident that by continuing to work together as we have been there is nothing we can't overcome. I really appreciate the applicant’s willingness to listen and work with us to help us achieve our vision. It wasn’t easy for them or us. But in the end I believe we have something that we can all be proud of. Special thanks also to our amazing town staff who spent countless hours on this project as well as the Eastern Gateway component of the Cary Community Plan. As a member of the council I have had the pleasure - or not - of working with staff members from other municipalities or agencies. None of them can hold a candle to the dedicated and talented group of folks at Cary Town Hall. Cary's staff are the best! That's all for now. As always, thanks for reading! At our council meeting this past Thursday we unanimously approved the Urban Drive Townhome Rezoning. 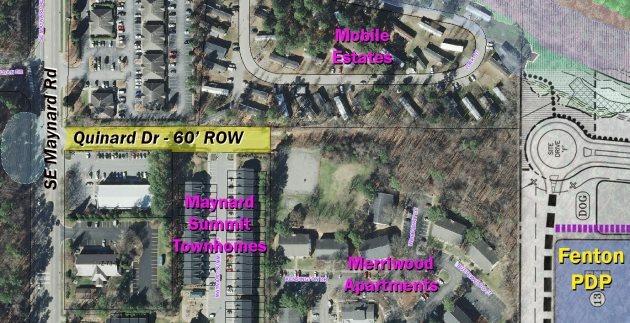 This request rezones one lot along Urban Drive from Medium Density Residential (MDR) to Mixed-use allowing for the construction of five townhomes that will be integrated into the Chatham Walk Condominium project at the corner of Chatham and Urban. 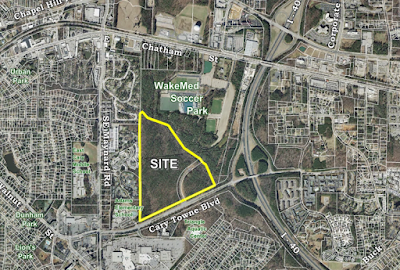 The Chatham Walk condominium project did not require council consideration as the use is already allowed under the existing zoning which was put in place in 2001 with the adoption of the Town Center Area Plan (TCAP). 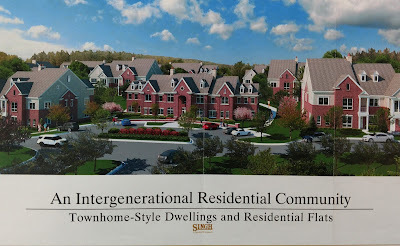 The Chatham Walk Condominiums would still be built whether or not we approved the townhomes. So while we technically weren’t considering the condominium project, we were considering a component of it – separating the two was difficult as the proposed townhome layout relies on the condominium site for access, parking and stormwater management. Downtown residents expressed both support and opposition to the proposal with the majority of residents along Urban Drive in opposition. Concerns included building height, neighborhood character, transition, building set-backs and stromwater/flooding. 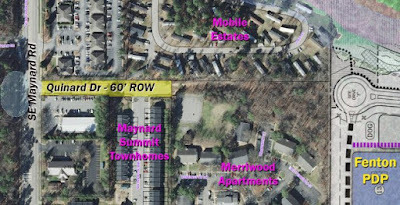 1) Stormwater runoff from the roof and driveways of any townhome building constructed upon the property shall be diverted to the existing stormwater system within Chatham Street. While this clearly won’t in any way solve the stormwater problem downtown, it won’t make it worse either and may actually help a bit as runoff post-development will be mitigated vs no stormwater mitigation pre-development. Cary’s stormwater requirements now are MUCH stricter than in years past. 2) The applicant has also offered conditions related to building design and architecture. These include locating the principal entrance on Urban Drive for any townhomes with frontage on Urban Drive, providing a minimum percentage of masonry material on building facades, and limiting the use of vinyl siding to soffits and architectural accents. The intent of these conditions is to provide an architectural transition between the existing single-family homes and condos and respect the residential front door feel of the neighborhood. 3) Conditions were also offered to provide a six-foot tall fence or wall within ten feet of the boundary line and a ten-foot building setback from the southern property line (the same set-back requirement that exists with MDR). The townhomes will be three stories tall with a maximum height of 45 feet - the same height that could have been built by-right under the existing MDR zoning. That deserves repeating - a 45 feet tall residential building could have been built on this site today without any council consideration or citizen input. The primary difference between the existing zoning and that requested is the number of units and access/parking. The townhomes will also better shield the condominium’s parking lot from view along Urban Drive. Another concern raised by area residents was “development creep” – that by approving this proposal we are opening the door for the rest of the neighborhood to be redeveloped with townhomes or other high density uses. While some parts of our downtown neighborhoods may see change over the coming years – especially those areas close to Chatham Street, Academy Street and Harrison Ave – the majority of downtown neighborhoods are planned to stay the same – except of course for remodels, additions or other improvements performed by homeowners – which is happening a lot these days! Here is an image of all the downtown sub-areas as well as the Central Chatham Sub-area where the site is located. So the bottom line is that if your neighborhood isn’t highlighted, it isn’t expected to change much nor do we plan for it to. If it is highlighted, change might occur if property owners choose to do so. I appreciate that change can be difficult for folks, I really do. But change is coming to downtown and for the most part this is a great thing. The condominium and townhomes above might look out of place today. They won’t look out of place in 5-10 years. A similar project is already in the works on the eastern corner of Urban and Chatham and the land on the northern side of Chatham St. has been assembled for redevelopment. 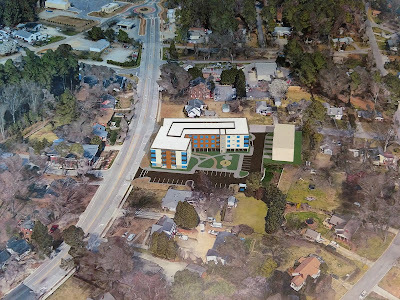 A number of other projects are also in the works downtown such as the townhomes along Park St across from the downtown park, the mixed-use development at the corner of Harrison and Chatham and private development at the downtown library parking deck. As new development occurs, we will continue to work to ensure that it is done in a manner that is consistent with our community’s vision for downtown and respects the character and charm of surrounding neighborhoods. I can’t say that I ever thought I’d dedicate an entire blog post to five townhomes, but the reality is that this case was much bigger than that. It was about striking a balance between existing residents and new development and sticking to the vision laid out in the Cary Community Plan. As downtown continues to evolve we will surely face similar challenges. I look forward to it. Cary citizens make Cary great! Every time I see the news I am reminded how blessed we are to live in one of the greatest communities in America. But I am also reminded that we must not take this for granted. It is so important that we as a community continue to support each other and give back, and there isn’t much that better demonstrates Cary citizens doing exactly that than some of the recent events in town. 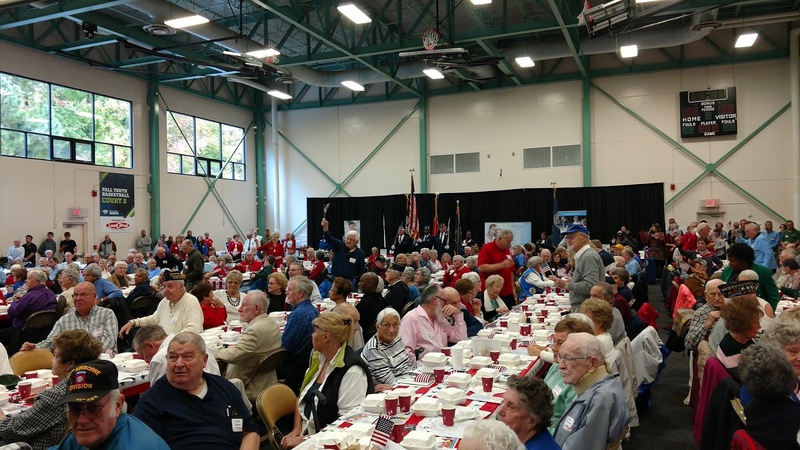 Cary hosted two Veterans Day events to pay tribute to and thank our veterans and their families for their sacrifice and service to our great nation - the 2017 Veterans Luncheon at the Herb Young Community Center and Veterans Day Observance Ceremonies at Veterans Freedom Park. Both events are always well attended. At the luncheon our veterans and their families are treated to a patriotic program, lunch and musical entertainment. 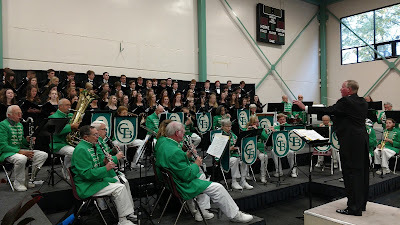 One of the more popular parts of the program is when the band plays the service songs of all the military branches and veterans from each branch stand and wave flags when their song is played. Their might even be a little competition between the service members of the different branches 😉 Thanks so much to the dozens of volunteers and Town of Cary employees who, without for them the event would not be possible; and special thanks to The Cary Town Band and the Cary Christian School Chamber Choir who did an amazing job – seriously, if you haven’t heard the these two perform together you’re missing out. Well done! 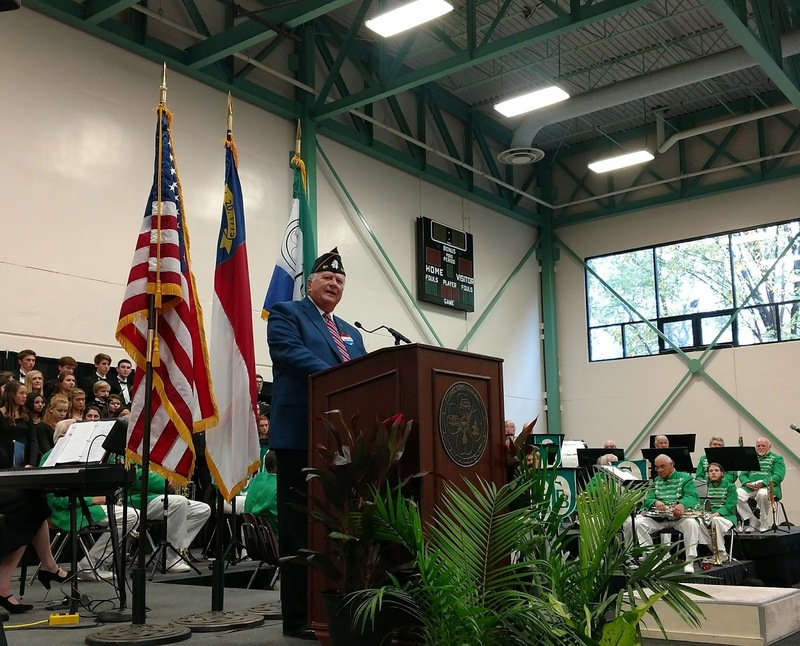 The Veterans Day Observance Ceremony at Veterans Freedom Park featured speakers from both the town and local armed forces community support groups. The Old North State Band provided musical entertainment and Carolina Veterans Support Group provided a field of flags that folks could sponsor. Little toy soldiers were provided for citizens to write a soldier's name on and place in the memorial as a way to honor those who have served in the armed forces. These soldiers will be saved and placed in the monument every Memorial Day and Veterans Day. And on a related note, back in September The Herb Young Community Center hosted the Veteran's Benefits Action Center. The Cary program in partnership with Veteran’s Affairs, allows eligible veterans and dependents a unique opportunity to be assisted by a team that includes Veteran’s Organization Service Officers, Department of Veteran’s Affairs, benefits officials and healthcare representatives. 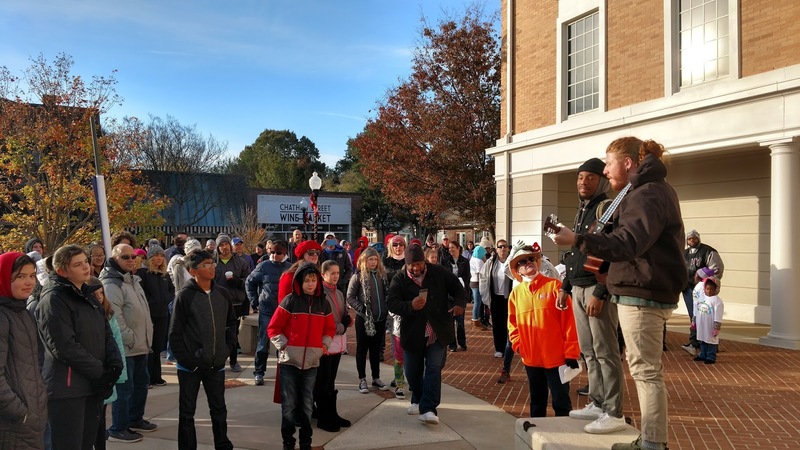 The Cary Unity Walk is an event to celebrate citizens working together to support local first responders and create a safe, unified, and nurturing community for our youth and our future. Produced by Fit and AbleProductions, nearly 300 people walked with Cary Police officers, firefighters and EMS personnel from Downtown Cary to WakeMed Soccer Park. Following the walk was a 5K/10K race which also featured kids games by Special Olympics North Carolina, performances by LA Dance, a fly-over by the Bandit Flight Team, the national anthem by the USO, and representatives from every branch of the military. Finding ways in which our citizens can connect with our first responders is so important, and I am so very proud of the fine folks at Fit and Able and our citizens for making this a priority. 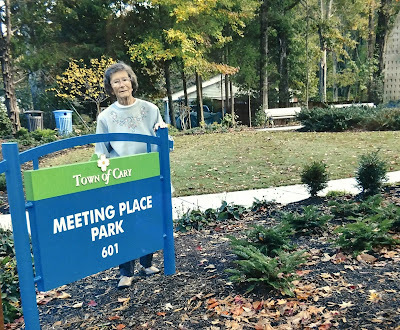 Cary’s Hometown Spirit Award is bestowed annually on a Cary resident who enhances the quality of life in Cary by preserving, promoting and carrying out positive and quantifiable traditional small-town community values and traits. Nine outstanding Cary residents were nominated this year by their peers. Nominees were recognized and honored at a reception at the Page Walker Hotel prior to our council meeting where last year’s Hometown Spirit Award Winner, Sheila Ogle along with Mayor Harold Weinbrecht opened the super top-secret envelope to reveal that this year’s award winner is, drumroll please…, Ralph and Daphne Ashworth! 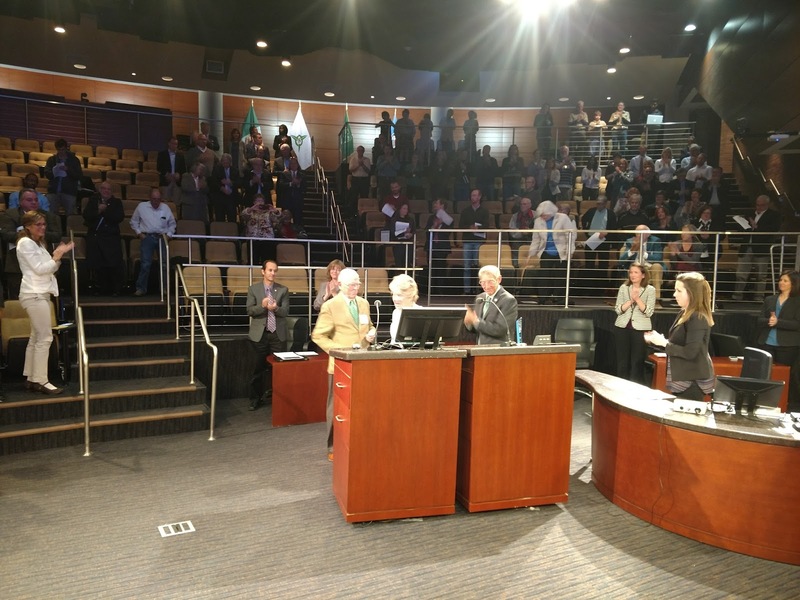 For 60 years Ralph and Daphne Ashworth have been very involved in both Cary’s business and philanthropic community giving time and treasure to make Cary a better place. Their list of contributions is long – real long – like there isn’t enough room on this blog to list it all long; and chances are that if you’ve lived in Cary for any length of time you are familiar with the many wonderful contributions the Ashworths have made to our community – they are legends. If not, I’d encourage you to learn more about them here, here and here. We are forever grateful for their lifetime of service. Cary is literally a better place because of Ralph and Daphne Ashworth and their family. 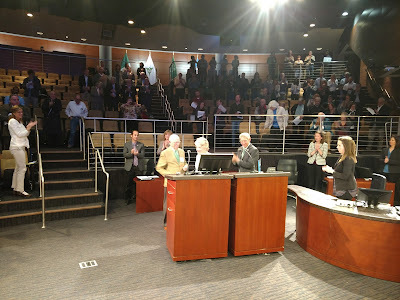 At our most recent council meeting we changed the name of Meeting Place Park in Downtown Cary to Kay Struffolino Park to honor Kay for her over 40 years of service and volunteerism to Cary. 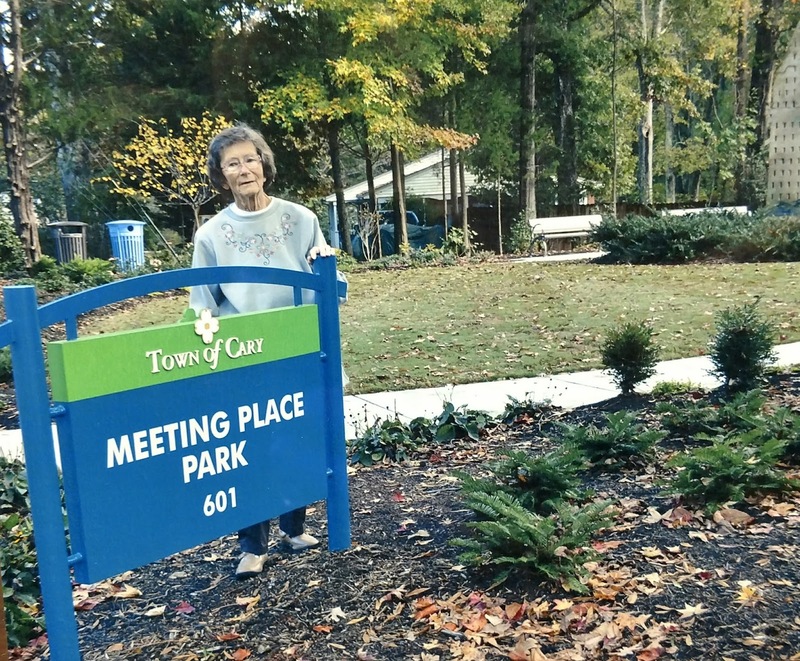 Cary’s 2010 Hometown Spirit Award Winner, Kay has dedicated her life to making Cary a better place. She has adopted two parks to maintain, has donated thousands of hours and dollars to beautify Cary’s parks and greenways, and has served on numerous boards, committees, and task forces. Kay’s fingerprints are all over Cary. Kay is one of Cary’s greatest citizens and an inspiration to everyone. It is because of her selfless commitment to all things Cary that we renamed this park in her honor. Renaming Meeting Place Park to Kay Struffolino Park. In closing, I mentioned earlier how blessed we are to live in Cary – but just to be clear “blessed” doesn’t mean “lucky”. Cary clearly didn’t become one of the greatest places to live in America by accident. We have YOU, our amazing citizens to thank for that. So keep doing what you’re doing and if there is ever anything that we at the town can do to help you help us, please let us know! I am so thankful for each and every one of you! Happy Thanksgiving! 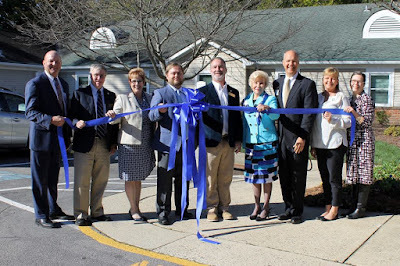 I was honored to attend Glenaire’s ribbon cutting ceremony for their new health care center and take a tour of the new facility with council members Bush and Yerha. Glenaire is one of the first retirement communities in North Carolina to transform its health center away from the traditional healthcare layout, into a home model. Now, residents needing skilled nursing care will have the privacy and normalcy of a real home. 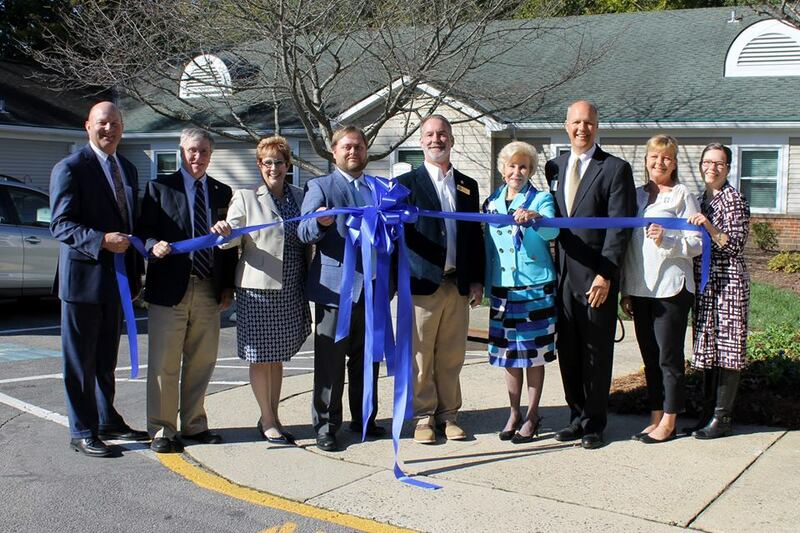 The expansion allowed for 4 “households” to be created in the assisted living and skilled nursing wings of the main building. Each household houses approximately 20 residents. This model allows for more individualized care between nurse and resident. We can’t thank all the fine folks at Glenaire enough for all that they do to provide high quality senior services in our community. 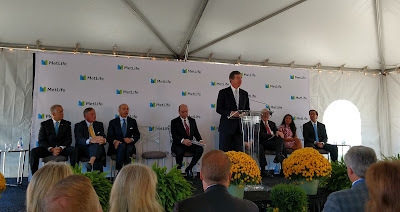 Mayor Weinbrecht, Council member Yerha and I joined a number of elected officials and business and community leaders to break ground on MetLife's 3rd building in Cary. The new building will be approximately 240,000 sq ft and bring an estimated 700 jobs to Cary. So, yeah, in case you haven't heard, at our most recent council meeting we unanimously approved the IKEA rezoning and associated preliminary development plan ;-) Construction will begin once building permits are approved and is expected to be completed in 2020. Redevelopment plans are also in the works for the remainder of the Cary Town Center Mall site and are currently going through the development review process and should come to council for public hearing soon so stay tuned. The Fenton mixed use rezoning on the state property across the street from Cary Town Center that includes the Wegmans project is on our council agenda for public hearing this Thursday. You can view the staff report for that project here. Also at our council meeting we considered and ultimately approved a request to change permitted uses in the Silverton Planned Development District on the properties below from commercial and office to allow for a senior life care facility and residential. This was a unique request in that both quadrants were combined into one rezoning and not considered separately. 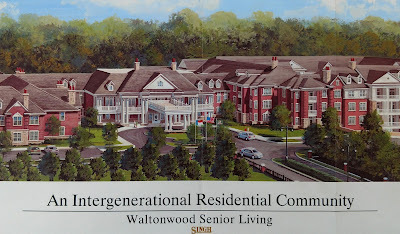 The reason for this was the applicant’s intent to create an upscale “intergenerational community” that would allow seniors and their families to be in close proximity to each other as well as provide easier, hassle free living for empty nesters looking to downsize and young professionals. 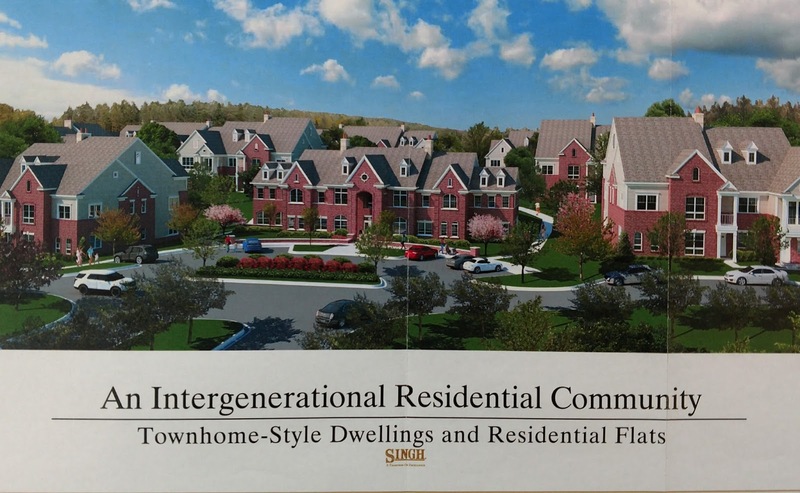 The senior living facility and age-targeted townhomes would be located on the southern property with townhomes and multi-family on the northern property. I really liked the senior living component for a number of reasons. First of all, it meets a desperate need in our community for additional senior housing and services. Believe it or not, Cary is the second oldest city in North Carolina and we aren’t getting any younger. The median age for Cary residents has climbed to 40 years old and 10+% of our population is already age 65 or older. Cary is such an awesome place to live that nobody wants to leave 😉 and they shouldn’t have to because they can’t find a place that meets their needs. Waiting lists for many Cary assisted living facilities range anywhere from 3-10 years. Secondly, the majority of area residents that I heard from to include folks who had opposed previous proposals – especially those living along or near Winfair Drive – expressed their support for the project as it would be less impactful to their neighborhood than a commercial development would. Assisted living facilities are very low traffic generators, quiet and safe. 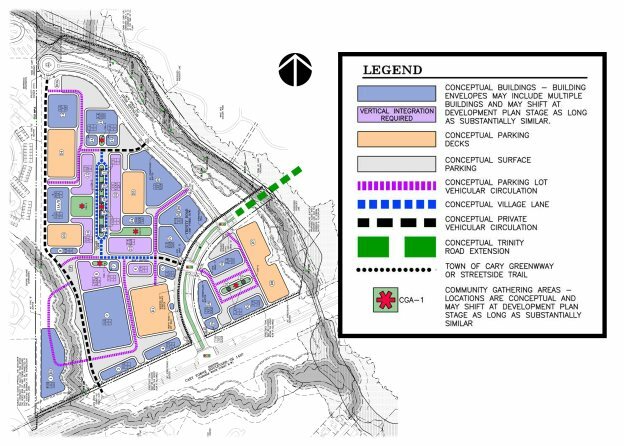 The multi-family component on the northern quadrant however is what made this case somewhat challenging as we had planned for office development on that site. The reality however is that the site has been on the market as office for decades with no one expressing any interest. It is not a desirable location for class A office development nor do our economic development folks consider this a priority office site. While it could possibly develop as neighborhood/medical/dental office sometime in the future, the existing office quadrant on the other side of Evans Road (where the Dental Society and Primrose are located) that still has land available for office has not experienced any additional demand for space. The proposed multi-family development is a product fairly unique to our region. It is comprised of stacked ranch and townhome residences with direct entry garages and architectural design elements that exceed Cary’s strict standards. 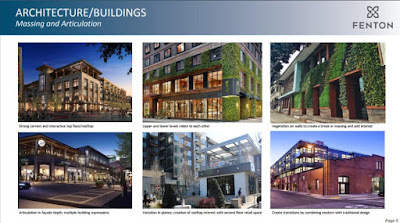 The applicant voluntarily added a number of conditions to the rezoning to ensure that the high-quality project they promise is what actually gets built. Notable conditions include direct entry garages, architectural elements, first floor master bedrooms on many of the units, 50% masonry construction and a gathering space/clubhouse and pool. They will also construct a greenway on the northern and eastern part of the site. The applicant has also committed to pay for a traffic signal at Winfair and Cary Parkway if warranted. A traffic study will be done one year after the last certificate of occupancy is issued and if it is determined that a signal is warranted, it will be installed. 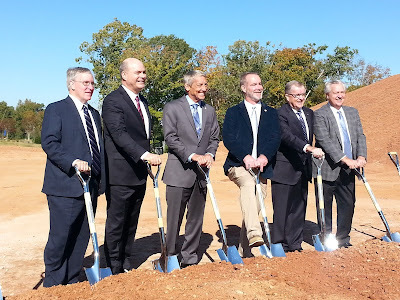 The developer is also making a number of area traffic improvements and the town will be installing dual turning lanes at Cary Parkway and Evans and a right turn lane on southbound Evans Road soon. Our town staff and planning board ultimately recommended denial primarily due to concerns regarding the loss of a potential office site, although staff did identify a number of positives with the project and stated that “they could go either way”. While we always value the advice of our staff and advisory boards, sometimes we simply disagree with their recommendation(s). This isn’t the first time we voted differently than what was recommended and it surely won’t be the last. The council takes seriously the request to rezone a potential office site to residential. Any proposal to do so must make a compelling case why. Taken as a whole and considering the majority support of area residents, the reality of market forces, conditions offered by the applicant that ensures a high quality product and development trends, the majority of council believed this proposal made a compelling case and was approved by a vote of 5-2. Well that's all for now. As always, thanks for reading! Welcome to my blog! Here you will find updates and information on my work as a member of the Cary Town Council. 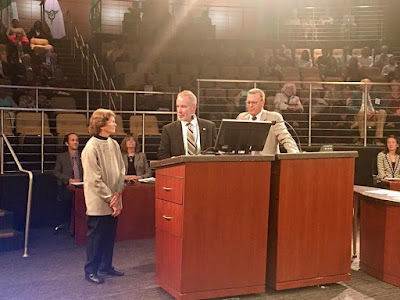 I began this blog because I believe that you, the citizens of Cary deserve to know what it is I am working on as a member of the council, what initiatives I support or oppose, how I voted and why I voted that way. I do work for you after all. 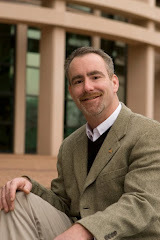 Member of the Cary Town Council District B. Small Business Owner, Frantz Automotive Center.